I heard a funny story years ago about the design of Hill College House, the first dormitory at the University of Pennsylvania built exclusively to house female students. The legend goes that when architect Eero Saarinen first met with Penn planners in the late 1950s to discuss the new dorm’s requirements, the words, “safety, security, protection” were repeated by the university’s administrators ad nauseam. As the Finnish-born Modernist was headed to 30th Street Station on his way out of town, he was overheard shaking his head and muttering, “They don’t want a dormitory. They want a goddamn fortress.” Whether or not the story is true, a fortress is what he gave them. After 15 months and $80 million worth of renovations, Saarinen’s clever display of defensive campus architecture reopens this month to welcome Penn’s incoming Class of 2021. From the outside, Hill College House, isolated on what was the eastern edge of campus when the dormitory opened in 1960, displays all the trappings of a medieval castle translated into a modern idiom. Spiked, metal battlements ring the roofline. Narrow vertical windows, alternating with wider horizontals, suggest loopholes excellent for shooting arrows at intrepid burglars or invading frat parties. A virtual moat circles the foundation, crossed by a narrow bridge that leads to the building’s only public entrance. In the original landscaping, thorny honey locusts filled the moat, a thicket that would dissuade even the most valiant Prince Charming. Hill College House shortly after it opened in 1960. Photo by Philly architectural photographer Lawrence S. Williams. | Image courtesy of The Anthenaeum of Philadelphia. That the iconography of fortification is presented with charm and wit attests to Saarinen’s flair as an architect. The nubby texture of the hand-forged bricks, the musical rhythms of the alternating window shapes, and the graceful curves of the spiked iron cornice temper the forbidding exterior. 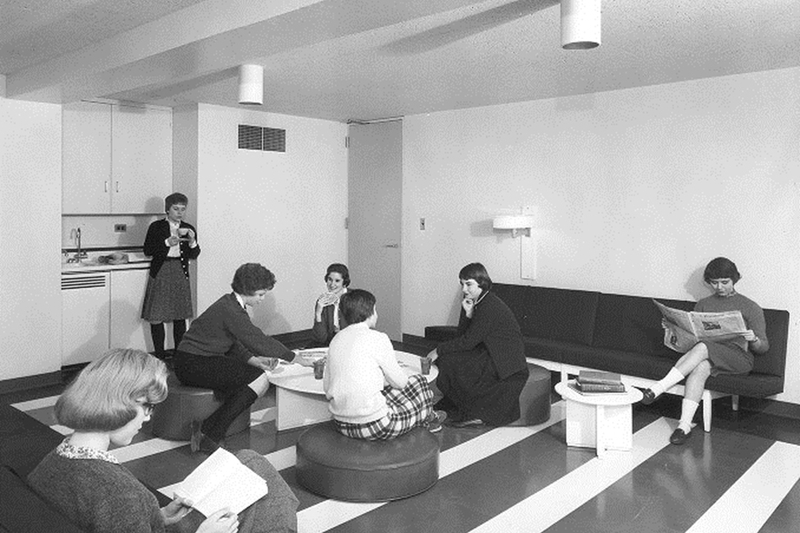 While the hard-edged Hill College House is decidedly more earthbound than Saarinen’s swooping St. Louis’ Gateway Arch or the TWA Flight Center at JFK, the dormitory displays a playful, subtle intelligence in its details. Saarinen carried through the fortress theme on the inside as well. The narrow bridge and single entryway leads to an astonishingly wide, white, soaring space, as airy and light-filled as the outside is impenetrable and dark. The central atrium rises from the basement cafeteria up five levels. At the very top, clerestory windows let in sunlight and glimpses of the sky. Enclosed balconies with louvered shutters overhang the courtyard, and a marble fountain gurgles below. That central space encourages communal interaction, while offering a series of smaller common areas, study nooks, and lounges for more intimate gatherings. Like a castle keep or convent cloister, these communal and contemplative spaces create their own self-contained world, well protected from “menacing” outside influences. 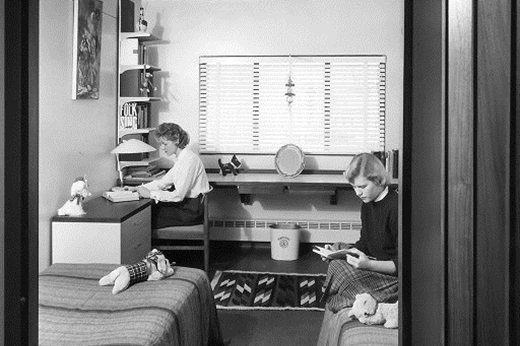 Life inside Hill College House in the early 1960s. Images courtesy of Facilities and Real Estate Services at University of Pennsylvania. The notion that women students needed medieval measures when it came to their safety became outmoded almost as soon as Hill College House was built. Parietals and curfews quickly became quaint customs, swept aside by protests and the Pill. The dormitory went coed in 1971, exactly a decade after it opened. 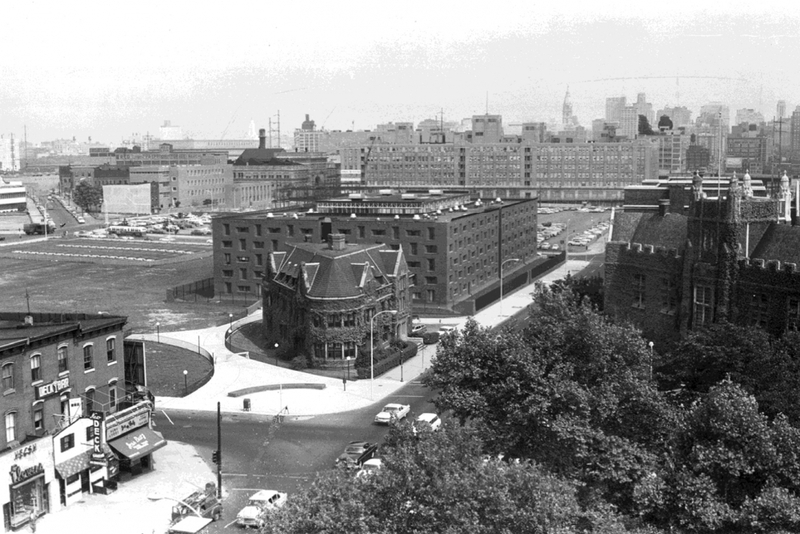 By then, concrete and glass highrise dorms dominated the west end of campus, making Hill College House, distant from both the Quad and the new residential center, seem a forlorn outpost in student life. Despite the airy central spaces, the cell-like dorm rooms were notoriously dark, damp, and infested with vermin. Lacking air conditioning, the dormitory might as well have been built in the Middle Ages. Hill College House, despite its architectural pedigree, became one of Penn’s most maligned residences. Mills + Schnoering Architects, the Princeton historical renovation firm hired to restore and upgrade the forbidding, Modernist landmark, faced a formidable challenge. They needed to rehabilitate and upgrade the long-neglected building to meet contemporary students’ expectations. 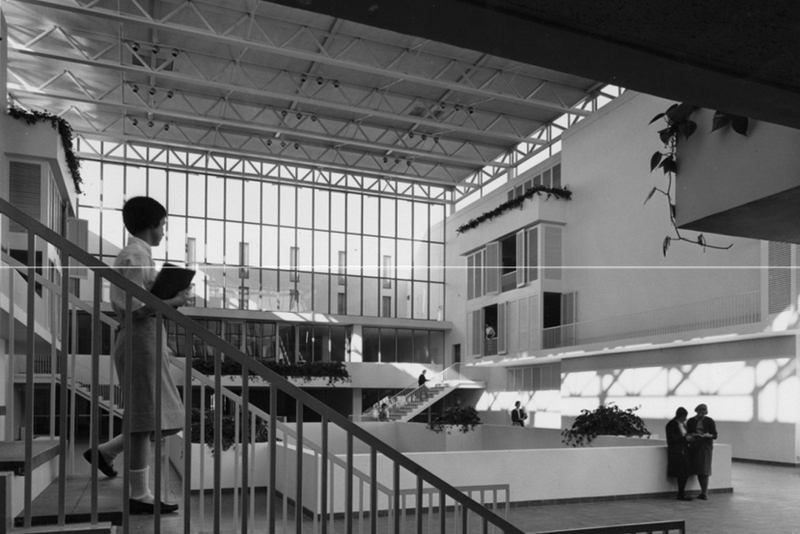 At the same time, the new systems and amenities–from air conditioning to gender neutral bathrooms (the first ones on Penn’s campus) to an upgraded kitchen and expanded, diversified dining facilities–had to honor Saarinen’s original vision. The 15-month, $80 million renovation project succeeds spectacularly on both counts. Having previously restored St. Louis’ Gateway Arch, lead architect Michael Mills and his team had become adept at channeling the Finnish-born designer and craftsman. 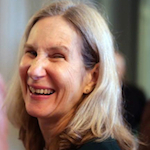 “Our guiding question was always ‘What would Eero do?’” said project manager Alison Baxter. Immersing themselves in the Saarinen archives at Yale and Cranbrook Academy in Michigan, where Saarinen taught and practiced the whole of his brief career, the design team not only reconfigured spaces honoring the architect’s vision, but replicated carpet and upholstery patterns as well. Saarinen was meticulous in his geometries, even stipulating the layout of chairs and tables in common rooms to correspond with shapes on the exterior. He also guided residents through the building with bold color coding. Michael Mills and his team amplified the color scheme and signaled their own design interventions through explicitly new geometries and materials. Circles, for instance, never appeared in Saarinen’s strictly rectilinear layout. Now, the ceilings of lounges and study nooks are adorned with Saturn-ringed LED lamps, a 21st century touch that complements, rather than contradicts, the original design. As a result, the Hill College House renovation reads as a sparkling conversation between past and present, a lively interchange that showcases the intelligence and clarity of the original design muffled and muddled over five decades. Aside from the technical sleight of hand required to hide a massive, new HVAC system, the architects’ biggest challenge was to reposition a self-effacing loner of a building, designed at a time when Penn’s urban location was a liability, as an engaged citizen of the surrounding city. The restored Hill College House follows last year’s opening of New College House, which redefined and recharged the once flat, blank grassland called Hill Field into a verdant thoroughfare connecting Penn’s campus with Center City. As a companion to New College House, Hill House stands alert, if slightly aloof. The moat, now filled with less forbidding plant materials, still creates a sense of detachment. Together, though, the two make intriguing gate posts to the university’s eastern entrance. Symbolically, they embody two aspects of a college education: the active and the contemplative. New College House inclines toward the city, framing vistas of skyscrapers and street traffic in its glassy, transparent rooms. Hill College House, in contrast, offers sanctuary. Inside, only light and sky (and the very tip of the new FMC tower) can be seen through high, clerestory windows. There is no evidence or intrusion from city or campus outside. Some of the dorm rooms do look out onto busy Walnut Street, but small windows and a screen of trees limit their urban view. In his all too brief career, Eero Saarinen, who died of a brain tumor in 1961 and never saw Hill College House or many of his most defining works completed, left the world a rich legacy of iconic forms, inspiring spaces, and sensual materials. Although Saarinen is celebrated now as a Modernist master, that label doesn’t capture his singularity as an architect. Hill College House defies categorization. Those rough-textured, chiaroscuro-shaded bricks on the exterior walls look back to Modernism’s foundation in the Arts and Crafts movement. Cranbrook, where Saarinen taught, is still today an influential art and design school devoted to developing a contemporary idiom for traditional crafts, from weaving to furniture making to architecture. At the same time, in embracing architectural allusion–those crenellations and other castle references–Saarinen anticipated the antic quotations of Post-Modernism by more than a decade. Saarinen is also one of those exceptional architects whose buildings appeal simultaneously to emotion and reason. With Hill College House, the architect speaks with precise and ordered geometries, the clear illustration of the building’s flow and function through form and color, and an exquisite attention to details that repeat and vary with mathematical elegance. But he also orchestrates breathtaking shifts between closed and open spaces. Surprising vistas, a sudden splash of color, and the musical cascade of falling water from the central fountain all energize, uplift, and inspire. Saarinen’s work has certainly affected me. A flight out of his transcendent TWA Flight Center at JFK more than 40 years ago inspired me to write about architecture. The 500 freshmen who moved into Hill College House last week will likely find the new, air conditioned rooms, flat screen TVs, pool tables, kitchen-equipped lounges, and other 21st century amenities more thrilling than subtle, design interplays of line and color. The students will ultimately judge the building for its comforts and ease. But even if they absorb Saarinen’s design, and Mills + Schnoering’s intelligent interventions, subliminally, they are in for a treat. The Class of 2021 will be eating, studying, and playing in an environment that stimulates both the left and right sides of the brain. Living in Hill College House, for those who pay attention, will be an education in itself. Loved the article for the details, explanations and commentaries regarding the original design and the modernized improvements. Is this some type of bad joke? The interior looks old and tacky. What the hell did they renovate, and where did that $80 million go?!?!? !